Ah, the surprising American Pelecinid wasp! Surprising because it is an impressive insect to see flying through the air; because despite similarities in size and shape, it is not a damselfly; because it appears to have a fierce stinger but appearances can be deceiving; because it is the lone remaining genus in its family; and because it’s got that parthenogenesis thing going. American Pelecinid wasps (Pelecinus polyturator) (APWs) are one of the BugLady’s favorite insects. They belong in the family Pelecinidae, and they are a New World wasp (with distant, fossilized/amber-ized relations from the Old World). APWs are relatively common from Argentina through Canada, in woodlands, grasslands and gardens, from mid-summer to early fall. Two other species occur exclusively south of the border. 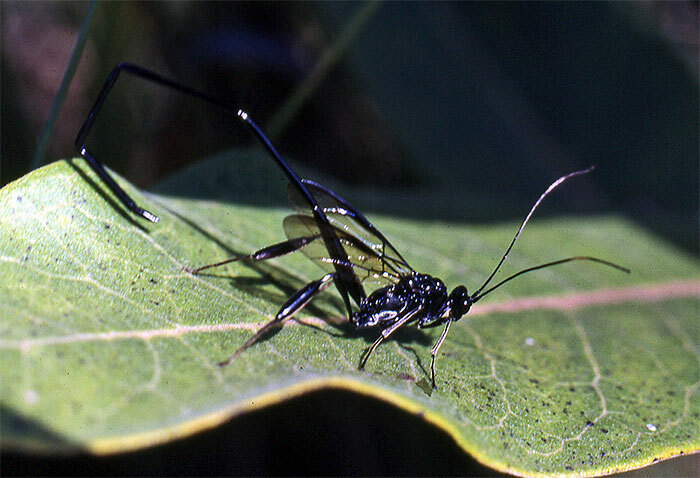 APWs are whip-thin, shiny, and black, with extra long antennae. A female may measure almost 2 ½ inches long, and her abdomen is five times the length of the rest of her body; males are only about an inch long. Pelecinids have short wings for their length and are slow flyers. The diet of adult APWs is nectar, perhaps supplemented by some pollen and water. Their larvae follow the parasitoid path. Mom reaches down into the soil with that wonderful, jointed, flexible abdomen and determines the presence of the larva (grub) of a May/June beetle. She deposits her egg directly into/onto the grub and goes her merry way, and when her larva hatches, it dives in. Its feeding kills the grub, and the APW larva continues to feed/scavenge on grub tissue until the immature wasp is ready to pupate right there in the soil. Biologists who gather June bug grubs to rear for experiments often find themselves with a wasp collection instead. A further word about parasitoid(ism). Parasites find it counterproductive to kill their hosts; parasitoids live to kill their hosts/kill their hosts to live. The only question is—how fast. Some parasitoids prefer live food and eat around their host’s vital organs until it’s time for the End Game. APWs do the deed quickly because they don’t mind eating dead tissue. The term necrotroph (from the Greek nekros—dead body, and trophe—nourishment) applies. According to Frost, in Insect Life and Natural History, parasitoids are plunked on the continuum between parasites and predators. Not only is their habit considered highly evolved, they often co-evolved with their hosts. Only insects with complete metamorphosis (egg-to-larva-pupa-to-adult) need apply for the lifestyle, and only their larvae have the ability to do it, though their victims may come from all walks of life. Some parasitoids specialize on a single host species and others are less picky. Along with the label parasitoid, they are also classed as endoparasites (endo meaning that the larva is feeding from the inside).